1 of 3 Coat slow cooker bowl with nonstick cooking spray. Add leeks, carrots, celery and potatoes. Whisk in milk, vegetable broth, Old Bay seasoning, garlic powder and nutmeg. Cover and cook on HIGH for 4 1/2 hours or LOW for 6 hours, 45 minutes. 2 of 3 Uncover and stir in asparagus, shrimp, scallops, crab and potato flakes. Re-cover and cook for an additional 15 minutes (on either HIGH or LOW; see Note). Season to taste with salt and pepper, if desired. 3 of 3 Note: Seafood cooks very quickly and can easily get tough. 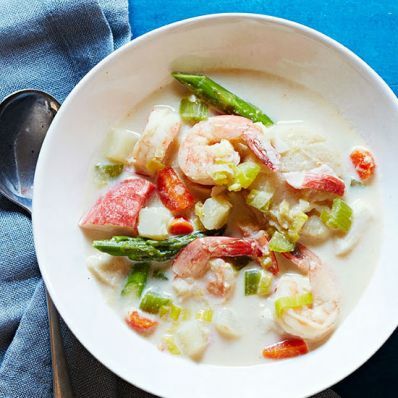 Make sure that shrimp and scallops are opaque yet tender and crab is heated through.